This morning’s Meet The Press opened with the misleading idea that Ed Gillespie and Robert Gibbs, senior advisers to the Romney and Obama campaigns, would be on the program together. Instead, host David Gregory interviewed them sequentially. I really do not understand the logic of this. It makes for a disjointed conversation and gives certain advantages and disadvantages to guests depending on whether or not they go first. More importantly, it is predictably more boring than letting the guests react to each other. Gillespie said President Barack Obama has turned the killing of Osama Bin Laden into a political issue, and that this “is the sign of a desperate campaign.” Gregory played a clip from a 2004 George Bush re-election campaign commercial which used the 9/11 terrorist attacks on the United States as a political prop. Gregory asked, is America safer under Barack Obama? America is not as strong as it should be or “will be under a President Romney,” replied Gillespie. There was no new ground covered in the economic discussion. Gregory then moved on to the issue of women voters saying they will be “the deciders” in this election. He asked, are Republicans on the defensive here? Gillespie responds that 2.7 million more women are without health insurance since President Obama took office and 858,000 fewer women are working. He also mentioned claims that the Obama White House is a hostile work environment for women. He then said the US economy is a hostile work environment for women under President Obama. 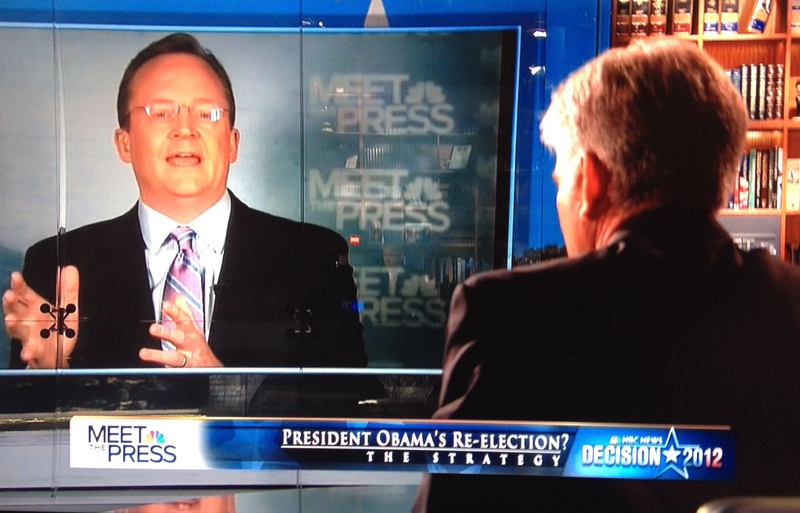 In the next segment, with Robert Gibbs, Gregory played a powerful Obama 2012 campaign commercial where former President Bill Clinton describes the decision to hunt down Bin Laden. Gregory asked Gibbs if this commercial was over the line. Gibbs said no and cited chapter and verse, going back to 2007, on how Governor Mitt Romney had said efforts to track and kill Bin laden were unimportant. Note that in both conversations, Gregory tried to get the guest to engage on the question, “Who is Mitt Romney?” But neither took the bait. The roundtable began with Democratic strategist Hilary Rosen again apologizing for remarks she made about Mrs. Romney. She said Mitt Romney’s policies should be the focus of the debate. Then came the fireworks. MSNBC’s Rachel Maddow, Republican strategist Alex Castellanos, and Representative Cathy McMorris Rodgers (R-WA) got into a very serious discussion about equal pay for women. At one point Maddow largely took over the program as host. Castellanos and Rodgers disputed the idea that women make less than men. At about 32 minutes into the broadcast the debate begins to move so quickly it seems the camera operators can’t keep up. This was one of the most substantive and heated conversations on Meet The press I have seen in years. It was quite refreshing to hear almost nothing about the polling data and battleground states, and instead hear about the very real policy divide which separates the campaigns. The program ended with a promotion of Brian Williams’ upcoming Rock Center special on the Osama Bin Laden mission. He interviewed President Obama inside the Situation Room. There were also clips from the Press Pass interview with Saturday Night Lives’ Jason Sudekis and Fred Armisen.